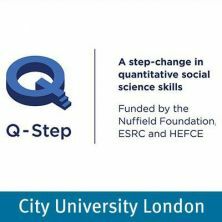 The aim of the City Q-Step seminar series is to engage those who have an interest in social data with the wealth of methodologies, resources and opportunities quantitative research affords in the social sciences. The City University Q-Step team will be running seminars every term to showcase the most innovative techniques and interesting findings from data visualisation experts, bloggers, researchers, and academics. Full Fact is a non-partisan, independent factchecking organisation that checks the claims of politicians and the media, pressing for corrections to be made to unsubstantiated claims. Since Full Fact launched in 2010, MPs, Ministers, government departments, pressure groups and nearly every national newspaper from the Sun to the Financial Times have issued corrections as a result of their research. In this seminar Full Fact will explain how they factcheck, and tell us about their 'Election Centre' - a rapid response factchecking service reacting to claims made during the upcoming General Election campaigns and provide free information to researchers, journalists and voters. For more information contact Rima Saini.